Season scallops generously with salt and pepper on both sides. Heat grill, spray asparagus with pam/cooking oil. I cut them into 1/3 pieces to plate. In a sauce pan on med heat, bring balsamic and honey to boil. Let it reduce until you get a glaze like consistency. If it is too thick, add some hot water. Heat pan on med high heat. When oil starts to smoke, add your pat dry scallops. Do not over crowd pan, and DO NOT TOUCH IT! Let it sear for 1.5 to 2 mins on each side. Use a tong to peek and see if the beautiful golden crust is formed. Then flip and do the same for the other side. 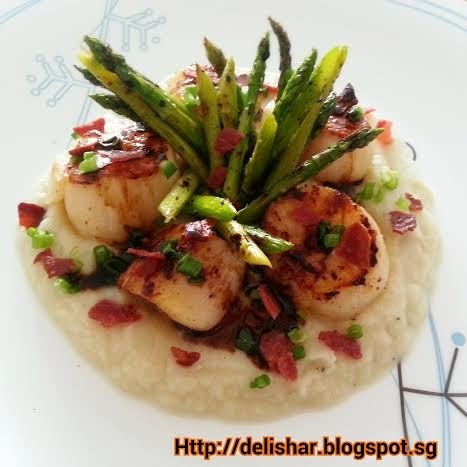 Sprinkle the spring onions and turkey bacon over the scallops. Drizzle honey balsamic glaze and serve!